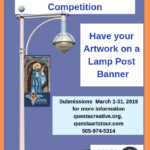 All local area artists are encouraged to submit their artwork to be considered for the Lamp Post Banner Project, phase 2 (read about phase i – the retablo banners, below), to showcase the wide range of artists’ styles in the Questa area. Submissions are being taken from March 1- 31, 2019. Images need to be a tall vertical format; artwork size is 30″ and 15″ wide at 300 dpi. We have 16 spots and are looking for both 2-D and 3-D art, contemporary to traditional. 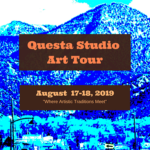 For more information see the Questa Studio Arts Tour website at or call Peggy at 505-974-5314. 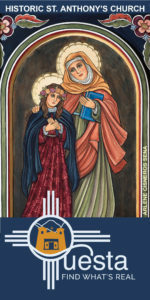 The first set of banners funded by the Questa Economic Development Fund (QEDF) exhibits the beautiful hand-painted retablos in St Anthony’s historic Church. The other two sets of banners will display artworks by local artists and craftspersons, and a third set will show historic photos of our village. We hope the retablos will be up for everyone to see very soon. There will be an opening celebration with posters of the eight images for sale in the near future. 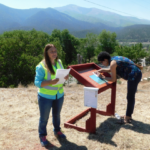 The QCC has partnered with the QEDF to develop 3 “Welcome to Questa” signs to be installed on the main roads as one drives into Questa. From the 37 entries that were received, three designs are now under consideration. 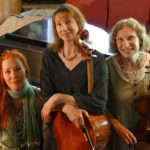 The Questa Chamber Music Series gives a venue in rural Questa to talented local and visiting musicians, often hosted in a unique community venue; in doing so it honors the history of musical gatherings and community. The last concert in this 3-part series of classical music concerts will be held in the spring of 2019, More details will be announced. 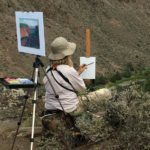 Artists from Questa and the surrounding communities will open their studios or gather at easy-to-find hubs offering unique, hand-crafted works from traditional to modern. 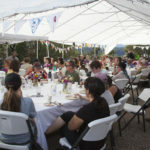 The route begins on the south side of Questa, reaches the edge of the national forest to our east, and ends north, in Sunshine Valley. 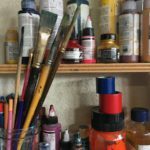 Add your art to our event, or enjoy meeting your neighbors and artists! MORE…. QCC has scheduled, hosted and facilitated multiple “creative” workshops and presentations in 2018 and early 2019. These opportunities focus on knowledge gained and entertainment. 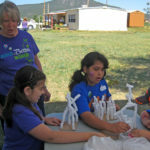 For example, some categories of workshops included Artist Marketing, Artistic Skill Development, Traditional Arts and Crafts, Youth Art Programs and Traditional Holiday Foods. More are in the works. Check our calendar page for specific dates. Click on images or “MORE” links for more info or to become involved with these projects!